The thought of eating an insect makes most people cringe – at least those who live in America, Canada and Europe, a minority of the world's population who would not let a cricket, grasshopper or beetle near their dinner table. The "yuck" factor, however, does not have anything to do with nutrition, digestion or evolution. In fact, according to a new Rutgers study, insects, the food choice for our early primate ancestors, could still be eaten and digested by almost all primates today, including humans. "For a long time the prevailing wisdom was that mammals didn't produce an enzyme that could break down the exoskeletons of insects, so they were considered to be very difficult to digest," said Mareike Janiak, a doctoral candidate in the Department of Evolutionary Anthropology and lead author of the study published recently in Molecular Biology and Evolution. "We now know from research on bats and mice, and now my research on primates, that this isn't true." Janiak and collaborators from Kent State University discovered that almost all living primates still have working versions of the gene needed to produce a stomach enzyme that breaks down exoskeletons. The scientists looked at the genomes of 34 primates, searching for copies of a gene called CHIA the stomach enzyme that breaks down chitin, which is part of the outer covering of an insect. What they discovered is that while most living primates have only one copy of the CHIA gene, early primates, which tended to be very small, had at least three working copies. This shows that insects were an extremely important food source for our early ancestors. Some living primates, like the tarsier, which eat more insects than any other primates, and today exist only on islands in Southeast Asia, have five copies of the gene, because it was duplicated specifically in this lineage. "As some primates evolved to be larger and more active during the day than at night, their diets shifted a bit to other foods like fruits and leaves," Janiak said. "Insects became less important and their digestive enzymes changed, but most living primates still have at least one working CHIA gene." How effectively humans digest an insect's exoskeleton is still being debated in the scientific literature. While some studies have found that human stomach enzymes can digest the harder-shell outer covering of the insect, Janiak said other researchers say they cannot find any evidence this is the case. "Unfortunately, most of the human research so far has been done using western culture participants rather than comparing people from various cultures that actually eat insects regularly," she said. "But for humans, even if we didn't have an enzyme, the exoskeleton becomes a lot easier to chew and digest once the insect has been cooked." 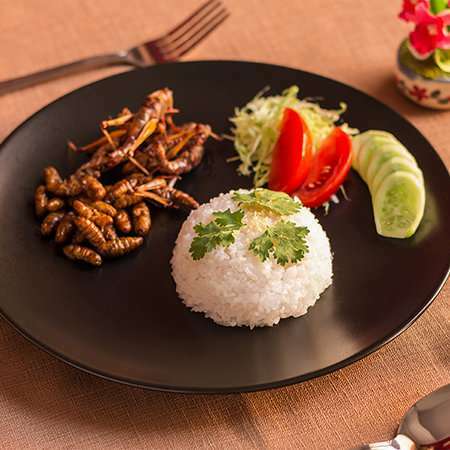 According to the United Nations, insects are part of the traditional diet of 2 billion people around the world, with 1,900 species considered both edible and a highly nutritious food source with healthy fats, protein, fiber, vitamins and essential minerals. Janiak, a vegetarian, has eaten tiny crickets from Japan marinated in a salty paste that she describes as tasting like a salty snack with a little extra crunch. She said a friend who was working in Uganda ate cooked grasshoppers that she said tasted like chicken. She says new food ventures, like the Bitty Foods, that use sustainably raised crickets to make cricket flour, may make people from western cultures more willing to look at insects, which have a much smaller carbon footprint than beef and other livestock, as a food and protein source. "It's interesting that many people who like shrimp and lobster think insects are yucky," she said. "But shellfish are kind of like underwater insects." Id definitely eat bugs - if there was nothing else. What utter nonsense. Someone thought we need a study for this? Go into Special Forces. You'll find out quickly what bugs are good to eat. Ask someone who studies primates. This ain't exactly news.